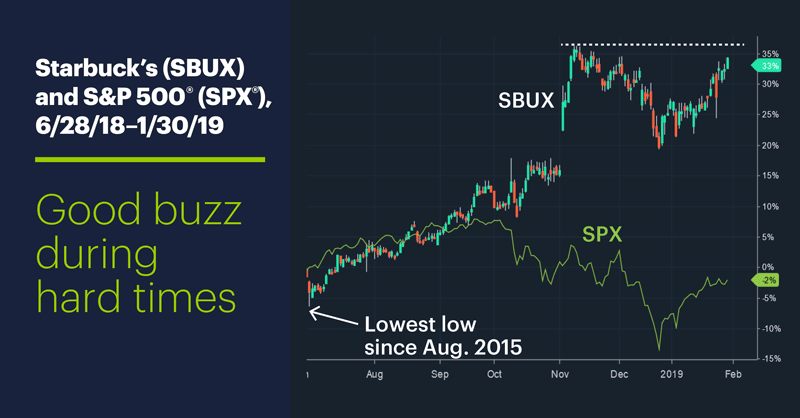 Schultz’s public musings over higher office have, in recent days, probably overshadowed more important Starbucks-related news, at least for traders: The reinvigorated uptrend in SBUX shares. The chart also shows the stock got an extra jolt of caffeine after its last two earnings releases, the most recent one just five trading days ago on January 24. But the stock’s rebound since the December 24 lows has trailed the SPX by about a percentage point, which raises the question of whether the current upswing has the potential to be of venti proportions. Starbuck’s isn’t about to disappear from China—it’s been there 20 years and still dominates the country’s specialty coffee market—but facing direct competition and a Chinese economy that appears much less bulletproof than it did a couple of years ago, some SBUX bulls may consider themselves better served by looking for buying opportunities during downturns than banking on a sustained breakout move above all-time highs. And short sellers may see more significance in nearby resistance levels, especially if a post-earnings bump runs its course. 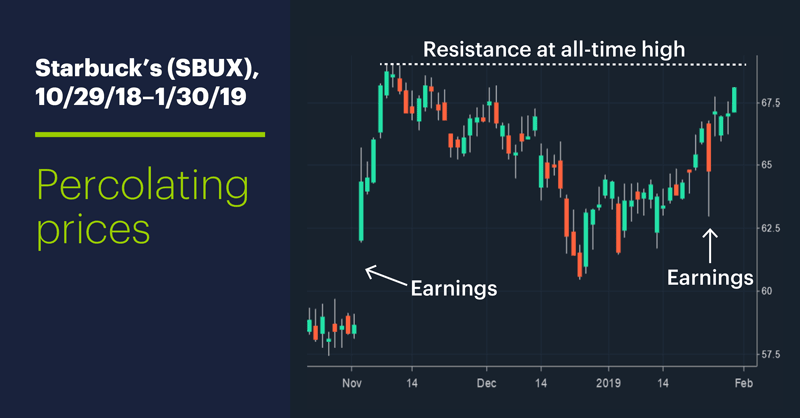 Boeing’s (BA) earnings announcement revealed the company topped $100 billion in sales for the first time; the stock jumped more than 6% intraday. Traders took more tepid sales numbers from Apple (AAPL) in stride, pushing up the stock by about the same amount they did Boeing. Today’s numbers (all times ET): Personal Income and Outlays (8:30 a.m.), Employment Cost Index (8:30 a.m.), EIA Natural Gas Report (10:30 a.m.). Today’s earnings include: Altria (MO), Baker Hughes (BHGE), Baxter (BAX), Celgene (CELG), ConocoPhillips (COP), DowDuPont (DWDP), General Electric (GE), Hershey Foods (HSY), MasterCard (MA), Northrop Grumman (NOC), Raytheon (RTN), UPS (UPS), USG (USG), Amazon (AMZN), Cypress Semi (CY), Edwards Lifesciences (EW), Mattel (MAT), Symantec (SYMC). 1 Forbes. Starbucks Doubling Down On Delivery In The Face Of Competition In China. 12/11/18. 2 Reuters. Coffee startup Luckin plans to overtake Starbucks in China this year. 1/3/19. 3 CNN.com. Fed holds rates steady amid economic uncertainty. 1/30/19.